Development of the ANTIOCH MARINA began in 1986 and the Marina was completed in 1988. The berths are on the east side of the Marina, with two gangways serving the six main walkways. The size of the Marina basin confined within the sea walls is approximately 800 feet by 750 feet (12.8 acres), with an entrance 60 feet wide and a depth of 10 feet at zero tide. 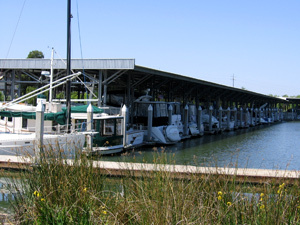 There are no channels to be considered as the approach to the Marina is a natural shoreline gradient from approximately 68 feet depth in the center of the San Joaquin River.